Hampshire have signed Abdul Razzaq, the Pakistan allrounder, to strengthen their squad for the domestic Twenty20 tournament. He will be joining his team-mate Shahid Afridi and Ajantha Mendis, the Sri Lankan spinner, who was one of the leading wicket-takers at the World Twenty20 in England last year. "I've always enjoyed my cricket in England as it is a home away from home due to the massive following Pakistani players have there," said Razzaq. "I will do my utmost to try and help Hampshire win the tournament." Razzaq has extensive Twenty20 experience, having played his first game in the format during a stint with Surrey in 2003. He captained Lahore Lions to the final of the RBS Twenty20 Cup last season, scoring 109 against Quetta Bears along the way. His familiarity with English conditions - he has also played for Worcestershire and Middlesex, as well as participating in the World Twenty20 last year - will also prove valuable. 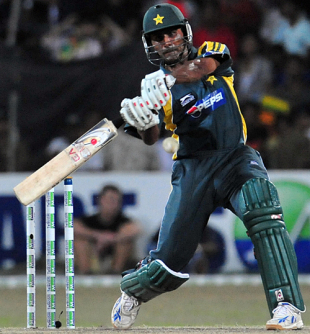 "Abdul Razzaq is one of the finest Twenty20 performers in the world," said Rod Bransgrove, Hampshire's chairman. "He will be a great asset to the side and adds even greater depth to an already impressive team. We have assembled arguably our strongest ever Twenty20 squad with the clear objective of reaching the Finals Day here at The Rose Bowl on August 14." In an effort to raise the profile of England's Twenty20 Cup competition, counties will be able to include four overseas players in their squads in the coming season but only two will be allowed in each game.